Dollhouse Mansions has offered expertly crafted, heirloom quality dollhouses since 1988, that will last for generations. Our dollhouses are built and manufactured in Woodbury, Connecticut workshop and customers are welcomed to view our finished dollhouses. 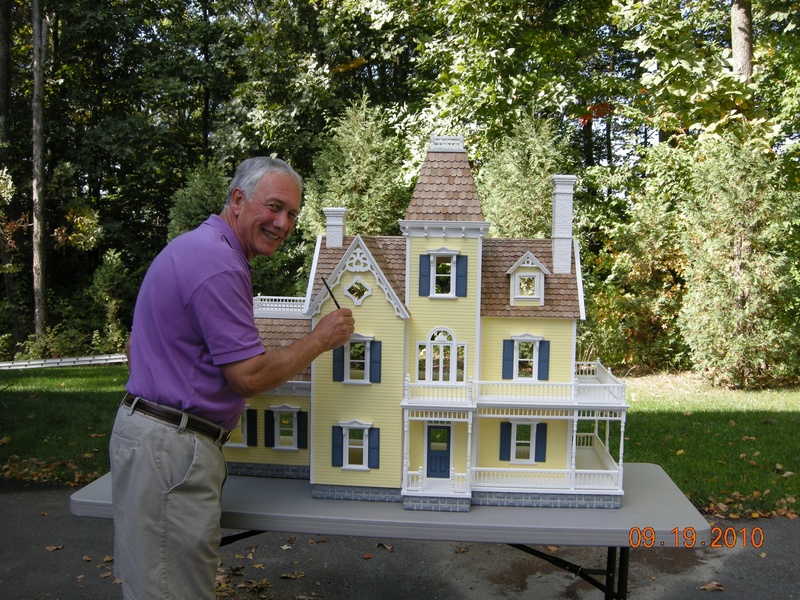 Owner and master dollhouse builder Rick Maccione has the skills and patience to build hundreds of dollhouses over the last 30 years. Design work is completed by his wife Joanne. Dollhouse Mansions offers a variety of quality dollhouse kits, assembled dollhouses and finished dollhouses. Our dollhouses are constructed with the highest quality of workmanship, hand crafted, and custom finished, 1 inch scale, hard wired electrification, in a solid wooden dollhouse that will last for generations. We sell unfinished dollhouse kits by the top manufacturers like Real Good Toys and all others or if you have a dollhouse kit we will build and finish it for you. Dollhouse Mansions offers pre-finished assembled dollhouses, some with wallpaper, flooring, and trim work completed are available. We offer many styles of dollhouses, such as colonials, Victorians, farmhouses, lighthouses, and firehouses. We build the complete line of kits from Real Good Toys. When deciding on a dollhouse, Dollhouse Mansions will help you make many decisions such as milled-in siding, front- or back-opening, 3/8″ or 1/4″ construction, cost and quality of components, which all make a difference in selection of your dollhouse. Custom finished dollhouses are our specialty and we always have plenty on display in our workshop. Our finished dollhouses are completely finished and painted on the outside, interior walls and ceiling are painted with three coats of latex paint. We find that most of out customers prefer to select their own wallpaper, carpeting, wood floors, lighting fixtures, and any other decisions that personalize their dollhouse. My company is based on three things, Trust, Honesty and Quality Workmanship! So talented. I love your beautiful doll houses!!! GOD has really blessed you !!!! I am just wondering if you are the person who built the dollhouses for the american cancer society many years ago. I have one, that I purchased from the person who won it in the raffle. Yes, I built dollhouses for the cancer society for 10 years, you could call my cell 203 768-3816 or email me at dollhousemansions@gmail.com if you have any questions or need me to complete any dollhouse work for you. I did send you an email, but was not sure you got it. Yes, I’m the guy that built those dollhouses for ten years for the cancer society. My email is dollhousemansions@gmail.com and my cell phone is 203 768-3816. Thank you for getting back to me. I will be in touch because I would like more information.and maybe you can help me with other problems. Today I was able to tip the house and it looks like the name russett crafts from new milfrord is written on the bottom. It was quite difficult to see it. Will be in touch soon. The company I think was called Russell Crafts, they went out of business about 15 years ago. Like I said, they may have used parts of several kits, or an original, or a kit manufacturer that went out of business before I started in 1988. “Dollhouse Mansions | Woodbury, Connecticut” http://karlyndejongh.
. Continue posting and I will continue reading through! That you’ve observed very interesting details ! ps decent website. it and return to read extra of the useful info. Thank you for any post. you are an authority using this subject. I try to do the best work I can, take no shortcuts, and keep the highest of standards when I build any dollhouse, no matter the size or the price. now and eventually got the courage to look forward and provide a shout out of Porter Texas! Thank you for taking the time to talk with me today. I am interested in lighting for my dollhouse. Any information you can send me would be greatly appreciated. It was nice to talk to you yesterday, I will do some research on those lights that I talked about and send you some pictures and prices. I would like to get an estimate on a dollhouse I built, real good toys Queen Anne, that I want completed, it’s half done on the interior, and the exterior needs so additional love. I can send lots of pictures. Hi Carrie, send me an email to dollhousemansions@gmail.com , tell me everything you want done and send pictures of all four sides of the dollhouse, so that I could give you a rough estimate. You could also call my cell 203 768-3816, so that we can talk about your project. I’d like to inquire on prices of several of your available doll houses for my daughters tenth birthday please. She liked several of them. I think it was the yellow, the pink, the purple and the blue. It was nice to talk to you this morning, call my cell 203 768-3816 after deciding which dollhouse you want and what you want finished for pricing. Good Evening, My daughter saved up her money to purchase a dollhouse kit in hopes my husband could build it for her but he was unable to. I was wondering if you can build it for her and what will the cost and time frame be to have it build? Thank you, I look forward to hearing from you. Yes I can build your dollhouse kit, I have been building quality custom dollhouses for 26 years and still love the work. Please send me pictures of the kit and the name of the kit company and the name of the kit style. Send to dollhousemansions@gmail.com , my cell is 203 768-3816 if you would like to speak to me. Also please tell me exactly what you want finished, for example ( finished completely outside, electrical wiring, walls and ceilings painted, trim work inside, real wood floors finished ) then I can give you a price. Do you have prices for your doll houses? You have beautiful doll houses. I have been looking for a good quality custom made house for a present. What do your house interiors look like? Also do you build furniture and things for the house? What are the prices and how long does a custom one take? Thank you so much! Thank you for checking out my web site, I have been building quality custom dollhouses for 28 years for customers all over the USA. Please call my cell phone 203 768-3816 to discuss some of your questions, so that I could more understand what style, and size dollhouse you want. I was also an Industrial Arts teacher for 34 years and worked in the real home building business, so I know houses inside and out no matter what the size. I will check on shipping to Australia. Yes I have a shipper that will ship to Australia, that Queen Anne kit cost around $1570.00 in US dollars without shipping. Please get back to me and I will get a quote on shipping the boxed kit. Do you want it insured? Do you build Greenleaf houses as well? 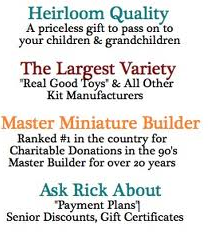 I’m a Master Dollhouse builder for 28 years, I can build over 200 dollhouse kits, replica of a customers house and restore old dollhouses. Sorry to say that I don’t build Greenleaf kits, there kits are made of very thin wood, I like to glue and nail my dollhouses and only work with 3/8″ plywood. Thanks for the reply. Do you know of a kit that could be used to create the house in the below link along with some of my own modifications? Thank you Diane for the kind words about my dollhouse building work. After 28 years I still love the detailed perfect work that I do. I would live to get my grandaugther a house she spends alot time playing with and makes small items.Are they very expensive and do you build them. I build a lot of dollhouses for granddaughters, daughters and adults from all over the USA. I could build over 100 different dollhouses in any size, style and price range. 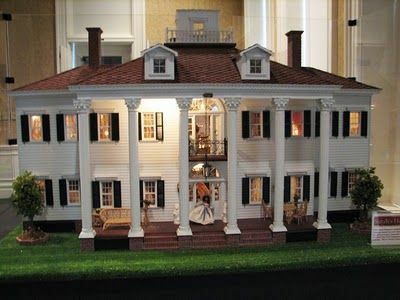 Please look again at my web site http://www.dollhousemansions.com , tell me what style dollhouse you want, like (Colonial or Victorian) tell me which ones you like on my web site or give me a price range and I will give you some prices. Also let me know when you need this dollhouse for. I’m building six dollhouses now and restoring two, work is always coming in. My cell is 203 768-3816, please give me a call and we might get this all answered over the phone in a few minutes. What dose the inside of your houses look like? What are the houses made out of? My dollhouses are made from 3/8″ quality birch plywood. When I build a customer a dollhouse, the quoted price includes completely finishing the outside of the dollhouse and priming and painting all the walls and ceilings. I paint the walls and ceiling before I build the house and put it together, therefore getting a perfect paint job on the inside. Painting the walls and ceilings after the house is built, will not give you as perfect a paint job and will take more time to complete. Do you have a dollhouse kit in mind that you want to have built? If, not I could also help you with that also. There are a few dollhouse kit manufacturers to stay away from because their wood is so thin, standard doors and windows don’t fit flush and their wood is cheap. When your dollhouse is finished on the outside and all the walls and ceilings are painted, we will discuss the many options in finishing the inside. Those options will be on an hourly rate plus materials. There are so many options in finishing the inside it is hard to quote. I will explain that process. Please give me a call on my cell 203 768-3816 and I will try to answer any and all your questions. I’m a retired Industrial Arts teacher for 32 years and a master dollhouse builder for 28 years and still love this detailed small work. Hi there. Do you ship to sydney australia. If so how much? I have a professional shipping company that ships dollhouses, and yes he can crate, ship and insure a dollhouse to Sydney, Australia for you. What type of dollhouse are you looking for? A finished dollhouse or a dollhouse kit in a box that you could build yourself. Let me know all the details and a price range you would like to spent? I have a layaway plan for you while I’m building your dollhouse. I build for customers all over the world and build dollhouses in any size, style and price. Thank you so much for the Beautiful Victorian Doll House you built for me. It is a true Masterpiece. I will cherish it for many years to come. You are so talented and thank you for keeping me up to date during the building process. Your pictures and professional advise have helped me make a wonderful choice during the process of purchasing this beautiful Doll House. Is there a catalog I could see? With houses and prices? I can build over 200 different dollhouse kits and make a replica of a customers house. Companies that manufacture dollhouse kits are always changing their line of kits, so it is hard to keep up. Please tell me how big of a house you want ( small, medium, large), how many rooms, what style dollhouse you want ( colonial, Victorian, other ), and what is your budget range? Then I can send you pictures and prices. Also look again on my web site http://www.dollhousemansions.com under kits that I build. You can also send me information directly to my email dollhousemansions@gmail.com and text to my cell phone or call at 203 768-3816. Looking forward to talking to you about your dollhouse dreams. It. I’m not sure if it’s copy righted or anything. Thank you. Please call my cell 203 768-3816 so we can talk about a dollhouse for your daughter. Just linked to you via Zena:-) Glad I did!! and I live close to Woodbury too! Not being offered for sale. Impossible to build anything in that range. I have a small dollhouse perfect for her age, made only two, gave one to my granddaughter when she was four, price is $650.00. Send me your cell phone number and I will text you some pictures. Go to Toys R Us, get something made out of plastic. I don’t build anything in that range. Do you finish houses that someone has started but didnt finish? Yes I finish dollhouses for customers that started a dollhouse and needs it finished. Please call my cell phone 203 768-3816 to discuss. Also send me pictures of all four sides of the dollhouse that needs finishing. Give me a list of all the work you want me to do? Hi Trudy, Yes I finish dollhouses for customers. Please call my cell 203 768-3816 to discuss. Yes I do, please call my cell phone 203 768-3816. I would love to talk to you about your dollhouse. Hi Mr. Maccione, My name is Ryan Bertrand I was a student of yours, graduated in 1997. You probably don’t remember me, but I remember you. I really enjoyed my time in your class! I’m so happy to see you’re still building doll houses. They really are amazing. If I had a little girl I’d get her one. Your craftmanship is amazing. Of course I remember you, and you were a very respectful student. I enjoyed every 32 years at Kennedy H. S. and all the dollhouse projects we all built for the American Cancer Society and other organizations. If you told me that I would be building Dollhouses for 30 years, I would have said you are crazy. I like being my own boss and love the small detailed work. My grandmother always said, “ Ricky you have the patience of a Saint” I guess she was right. It is amazing to build miniature houses for customers all over the USA, and two years ago for the movie industry ( 306 Hollywood) make sure you see it. Please give me a call, I would like to hear a lot about you and your family. Sorry I talked too much about my passion in building in miniature. Your work is extraordinary. You are featured in an article in today’s issue of Voices. Thank you for the kind words about my article in Voices. Yes I’m still in business, last month I celebrated my 30th anniversary in the dollhouse building business. Some of the houses are still available and some are not. Many dollhouse kit companies have gone out of business and those that are still in business have dropped half of their kit line due to less activity in this hobby. I’m a retired Industrial Arts teacher (32years), and Master Dollhouse builder for 30 years. My company is based on three things, Trust, Honesty and Quality Workmanship. I could build dollhouses from $2,000.00 to $40,000.00, so the first thing to consider is a price range that you want to spend and a style and size dollhouse you want. Best to call my cell phone 203 768-3816 to discuss your options. I’m looking forward to helping you out with a dollhouse selection. You can email me some of this information and include your cell phone number and I can get back to you with some information. I have very few finished dollhouses, they sell right away. I have so many orders for dollhouses coming in from all over the country it is hard to find the time to build display finished dollhouses for sale. It is best for you to tell me what style, size, and price range you want to spend and then I could find some kits that I could build for you. Send me your email and I will text or email some dollhouses I have for sale with prices. Do you work with customers on custom built pieces from the customer’s imagination? I have always wanted to build a dollhouse castle. Please give me a call on my cell phone 203 768-3816. Yes I complete projects like yours.